Mini Candy Cane's. Classic red and white striped mini peppermint candy canes. 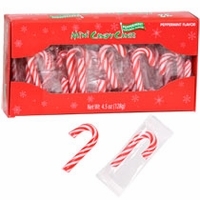 Each mini candy cane is small enough to fill a candy dish for minty treat. They may be small but they have a great peppermint flavor.